Sensei Modules adds an additional level of organization to your Sensei content between Courses and Lessons. A Course can contain any number of Modules, and each Lesson can be assigned to a single Module within that Course. Modules are only provided for organizational purposes; they don’t contain any content other than an optional text description. Go to Courses > Modules. Under Add New Module, give the Module a Name. Under Course(s), search for and select one or more Courses that will use this Module. 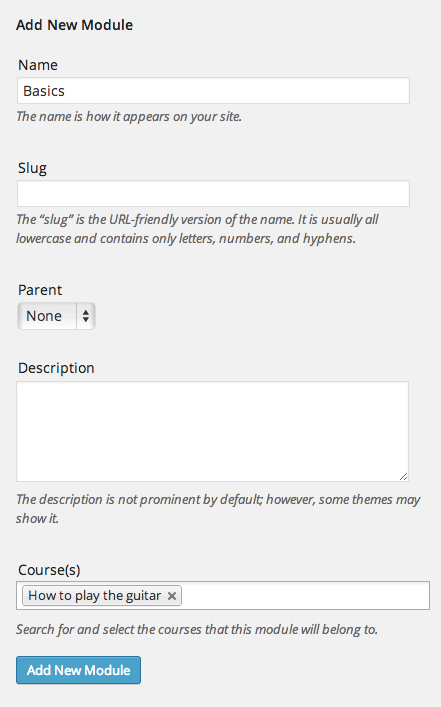 If you prefer, you can leave the Course(s) field blank and assign modules to courses later from the course edit screen. Modules can be used by multiple Courses. e.g., You may have a piano course and a guitar course, both of which use the Basics module. The Module is a container for a group of lessons in each course, so the lessons in the Module are unique to each course. Alternatively, you can add Modules from within a Course Edit page when creating/editing a Course. Go to Courses > All Courses. Click Add New, or edit an existing Course. You will see a Modules panel in the sidebar. Select any existing Modules you want to add to this Course. And/or click Add New Module, enter a Module name, and click the Add New Module button. Once you have added some Modules to a Course, you can then assign each of the Course’s Lessons to any of the Modules used in that Course. Go to Lessons > All Lessons, and edit the Lesson in question. You will see a new Lesson Module panel in the sidebar, listing all the Modules available in this Course. Select the Module you want to assign this Lesson to. By default, any modules you add to a course will be displayed in alphabetical order. 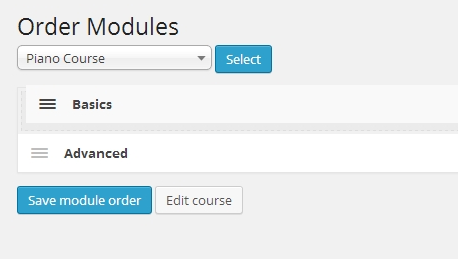 To reorder your Modules, go to Courses > Order Modules, select the course you want to edit, and simply drag and drop the modules into your desired order and click save. 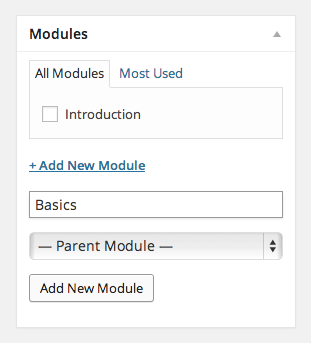 If a Course contains Modules, they will be displayed on the Single Course page, under the Modules heading, with each Module displaying a link to the Single Module page, and a list of links to the Lessons within that Module. After a user has completed one or more of the lessons in a module, they will see an ‘In progress’ indicator for that module on the Module page, and the Course page. After a user has completed all the lessons in a module, they will see a ‘Completed’ indicator for that module on the Module page and the Course page. Any Lessons not assigned to Modules will be displayed below, under the Other Lessons heading.